The failure of his first business venture did not deter entrepreneur Vinod Nair from pursuing his dream of establishing a thriving business. The 34-year-old's first business - property search engine HomeSpace - became defunct in 2008 because he had stiff competition and took the wrong advice. 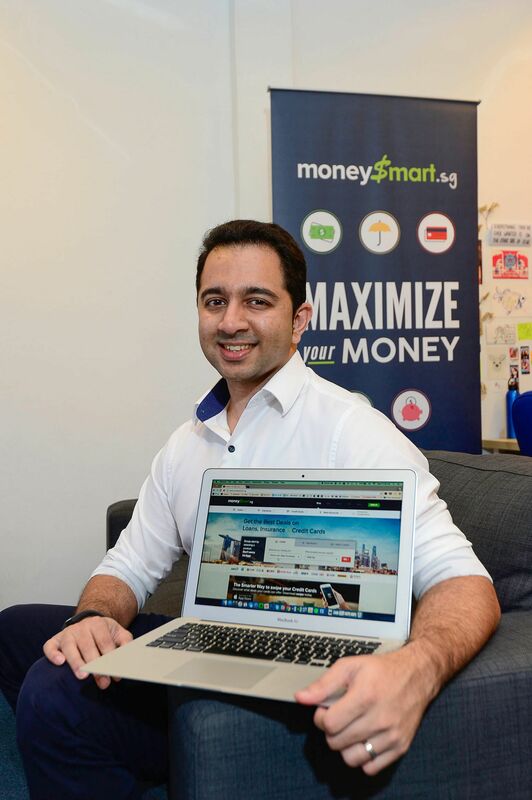 He did not give up and founded a second firm, financial products portal MoneySmart.sg, in 2009. After the first four rocky years, the firm earned a five-digit net profit last year. Its annual turnover is now more than $1 million. Although it has not recouped its first four years of losses, it has plans to grow its staff of 30. Mr Nair, who is chief executive at MoneySmart.sg, said he tried again as he could still afford to take the risk, given his age. He did not want to regret not giving entrepreneurship another shot. He said: "In my one year of experience, I had taken away so many lessons from mistakes that I had learnt not to make in the future. "I would be short-changing myself if I didn't give it one last go." I look at blue chips and will consider buying only if the stock is at a one-year low or cheaper. I have three further criteria. He ploughed the last $5,000 of his savings into the firm and decided that if it did not work out, he would just get a job elsewhere. He said: "In my view, at that point in time, there was a very low risk to starting the business." Mr Nair was inspired by a one-year entrepreneurship programme while at the National University of Singapore in 2005. It sent him to California where he took entrepreneurship classes at Stanford University and worked at software start-up eGrabber. He recalled: "I looked at Silicon Valley and thought, 'OK, they are solving so many problems. How can I solve a problem (here)?'" In 2007, he decided to adopt a model used in the United States to help real estate advertisers market properties. Back then, properties were advertised through classifieds in the newspapers. His business set up a real estate search engine which listed properties on sale in a certain area on a map. However, it faced stiff competition from more experienced entrepreneurs running PropertyGuru and iProperty. It also implemented a pricing model that was too complicated to gain traction with advertisers. The site was left to lie idle, and Mr Nair started MoneySmart.sg, which went live in April 2009. He and an intern were the only employees then. He was advised by consultancies to shut it down when it was struggling, but he trusted his instincts and persevered. Mr Nair said: "The first time, I would take advice wholesale from others. You just assume people are more experienced or know what they are talking about. "But as an entrepreneur, when you're doing something new for the first time, nobody has the answers, so you have to take advice with a pinch of salt and really trust your gut." Q What has been your biggest investing mistake? A All my investments have generated returns so far. Hence, I think my biggest mistake would be not starting earlier. In hindsight, I didn't need to wait till I had accumulated the buffer I had when I invested $6,000. I used to believe that you needed to have a lot of capital before you could start investing and used to think that it was very, very risky to invest in the stock market. If I knew then what I know now, I would have probably seen very high returns picking up good stocks during the 2008 financial crisis. Q And what has been your best investment move? A My best investment has definitely been my company, MoneySmart.sg. As a founder, I've invested my time and money both directly, through my initial capital put in, and indirectly through reinvesting in the company over many years instead of drawing a higher salary. I started the company with $5,000 of initial capital and the company today is worth a respectable eight-figure sum. He was convinced that consumers would eventually learn to compare and buy financial products online, the way they did with air tickets. He was proven right. His firm received a boost when the Do Not Call registry came into force in 2014, when people could sign up to opt out of receiving marketing messages. As a result, banks focused more on marketing products online. Last year, the firm raised $2.8 million in a round of funding led by the investment arm of Singapore Press Holdings. Individuals including SingCapital chief executive Alfred Chia and PropNex chief executive Mohamed Ismail were also part of the funding effort. Today, the site draws about 1.1 million visits every month. Mr Nair's wife, Ms Valli Pandit, 32, also runs her own business - a bespoke menswear store. Q Moneywise, what were your growing-up years like? A I am the eldest in the family and have a brother and a sister. My dad is a financial consultant and my mum was a primary school teacher. She is now retired. Our household income when I was in primary school was about $5,500 a month. We lived in a five-room Housing Board flat and moved to a condominium when I was 16. We were the average middle-income family. Q How did you get interested in investing? A I invested about $6,000 in CapitaLand when I was 29. That was my first stock. The price was at a two-year low and I thought Singapore's land scarcity would support the stock. Before that, I was investing in my businesses and felt I did not have sufficient funds left to invest. Q Describe your investing strategy. A I look at blue chips and will consider buying only if the stock is at a one-year low or cheaper. I have three further criteria. First, the product of the price-to-earnings ratio and the price-to-book ratio must be less than 22.5. Also, the price-to-earnings ratio must be below 15 and the price-to-book ratio less than 1.5. I am looking to hold them for 10 to 15 years, provided there are no sharp spikes in price. I invest primarily in banking and finance. I am able to assess the banks' consumer strategy in the course of my work, since I help them acquire customers. DBS and OCBC are strong in this regard, and when I saw their stocks on a downtrend last November, I picked them up. I am also invested in Reits like Suntec Reit. I visit malls to see how well they are doing and how good the tenants are, and I look at vacancy rates. I bought Suntec Reit in 2014 when Suntec City was not doing well and the property was in redevelopment. However, I thought the property was well managed and expected the management to bring the place back to life, based on looking at their plans. I invest in only local products as I am familiar with this market. For MoneySmart.sg, I am looking to provide information on a wider scope of financial products. People are increasingly buying financial products online, so we are hoping to tap into this trend. Q What's in your portfolio? A The portfolio is 51 per cent in Reits, 37 per cent in stocks and 12 per cent in exchange-traded funds that track the Straits Times Index. It is worth about $60,000 and average returns are about 3 to 4 per cent a year. Q What does money mean to you? A Money to me is freedom. It gives me the opportunity to pursue my passion and the ability to take risks. With regard to spending, I believe that you need to enjoy life, and to do that, you should spend on things you love. I take public transport to work every day. What I save from not having a car, I spend on what I love, which are mainly gadgets, food and travelling. Also, it is more important to be money-smart about your bigger expenses than the little ones. Getting one big decision wrong will negate all your efforts to save a few dollars here and there. Q What's the most extravagant thing you have done? A During my one-year stint in the US in 2005, I invested all my savings in a US$5,000 second-hand sports car - a Mitsubishi Eclipse. It was a once-in-a-lifetime opportunity to experience the excitement of driving a sports car. A year later, I sold it at the same price, so it was not such a bad financial decision after all. Q What are your immediate investment plans? A I intend to invest about $10,000 to $15,000 in the next 12 months when the Straits Times Index bottoms out. There is no scientific way of judging when it is at the bottom. But when it was around the 2,600 level, it was already at a five-year low, so you could not really go that wrong if you had entered then. Q How are you planning for retirement? A I set aside an average of $300 a month in a savings plan by an insurance company which gives annual returns of about 3 per cent. I was saving in this plan before I even bought stocks . I have two goals before I retire. I want to set up a successful business-to-consumer company and a thriving business-to-business company. This might take me till I am 50-plus, and maybe I will retire then. If I am living in an HDB flat, my wife and I will probably need $4,000 to $5,000 a month in retirement. The success of my businesses and my investments would hopefully provide for that. A My wife and I are living with my parents in a condominium in Bukit Timah. Our new five-room Build-To-Order flat in Clementi is due to be completed this month. Its value is around $630,000. I do not drive as the Downtown Line is within walking distance from my current place and Clementi MRT station is within walking distance from my new place.